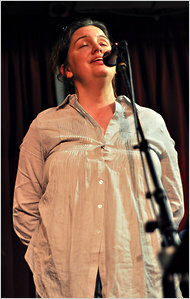 “As jazz singers go, Rebecca Martin exudes the plainest sort of poise, almost radical in its utter lack of flash. When she wasn’t cradling an acoustic guitar on Thursday night at the Cornelia Street Café, she held her arms clasped behind her back, as if to make sure they wouldn’t be a distraction. She sang quietly, favoring slow tempos. http://rebeccamartin.com/wp-content/uploads/2015/06/rm04.png 0 0 rebeccamartin http://rebeccamartin.com/wp-content/uploads/2015/06/rm04.png rebeccamartin2011-01-29 08:54:212013-02-09 21:17:04New York Times: "Spare Vocals Illuminate Emotions Underneath"